Info DEWEY, Thomas Edmund - Republican politician who served as Governor of New York (1943-1955) and was the Republican nominee for President in 1944 and 1948. 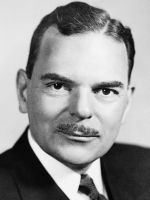 Born 3/24/1902 in Owosso, Michigan, son of George M. & Annie (Thomas) Dewey. His grandfather was a third cousin of Admiral George Dewey, and his ancestor Thomas Dewey settled in Massachusetts in 1634. His father was the local postmaster and publisher of a weekly newspaper the Owosso Times. A.B., Univ. of Michigan 1923. During his years there, Dewey won a Michigan state singing contest and placed third nationally. He took voice training in New York City, where he met his future wife, Frances E. Hutt (grandneice of Confederate President Jefferson Davis). They were married on 6/26/1928 and had two sons. Between the time of his first degree and his marriage, Dewey was busy. He earned a law degree from Columbia in 1925, and the following summer he toured Europe with college friends in an old car. Dewey started to wear a moustache during this trip. Special Prosecutor in New York City. Appointed by Gov. Herbert H. Lehman in 1935, Dewey gained fame for winning the conviction of Lucky Luciano in 1936 as a result of the Rackets Investigation. District Attorney (R, ALP, City Fusion) of New York County 1938-1942. Dewey was the first Republican to hold the post since Charles S. Whitman, who also had gone on to become New York Governor. Among his major convictions during his term were Tammany political boss James J. Hines, magistrate Hulon Capshaw, Nazi leader Fritz Kuhn, and mobster Lepke Buchalter. Dewey began the prosecution of Martin T. Manton, judge of the U.S. Court of Appeals, who had been selling verdicts. Dewey declined a second term in 1941. Candidate for Governor (R-NY) 1938. Dewey was nominated to challenge NY Gov. Lehman, who gave Dewey his start in politics. Dewey ran a campaign the NY Times called "spectacular" and came within a whisker of winning the race. His close call propelled him immediately into the national Republican spotlight. Candidate for President (R) 1940. Running in the Republican primaries, Dewey ended up with more pledged delegates than any other contender, but he was passed over at the brokered convention. Governor (R-NY) 1943-1955. Having nearly knocked off Gov. Lehman in 1938, Dewey was the clear favorite in 1942. He won the election by a margin of nearly 650,000 over John J. Bennett. In his first term, Dewey increased state aid for education, established a commission to eliminate religious and racial discrimination in employment, liberalized the unemployment insurance regulations, and worked to eliminate tuberculosis. Dewey was re-elected in 1946 with a majority of nearly 700,000 votes. During his second term, increased state surpluses were used to improve the state's highway system. Although he planned to retire after two terms, when his Lt. Governor, who had been nominated in 1950, dropped out of the race, Dewey ran a third time and defeated Walter Lynch in the race. Republican candidate for President 1944. Dewey won the nomination easily, though he did not actively seek it during the spring. Recognizing the difficulty in running against a popular FDR and not wanting to encourage the Axis powers, Dewey tempered his criticism of the Allied approach to the war. 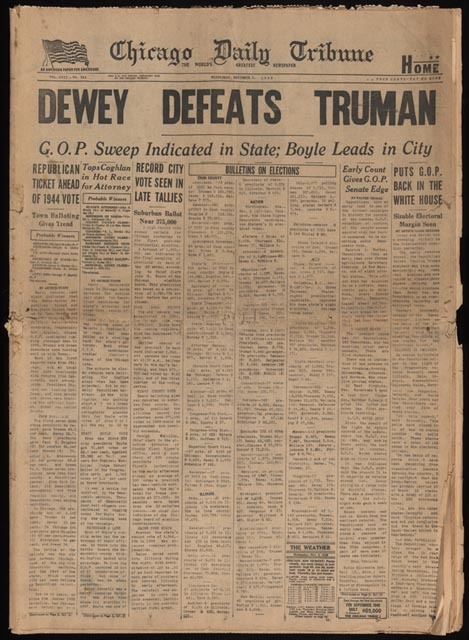 Although Dewey lost the 1944 election, it was the closest of FDR's four national victories. Republican nominee for President in 1948. Dewey campaigned aggressively in the primaries and was nominated on the third ballot (the last Republican National Convention to take more than one ballot to choose a presidential nominee). Dewey changed strategy for the general election. Running well ahead of Pres. Truman in the polls, he chose a more careful approach in order to minimize losses from moderate voters. As it turned out, Dewey gained heavily in the industrial states but lost support in agricultural areas - which was enough to elect Truman. Dewey died at 3:30 p.m. on 3/16/1971. He had played a round of golf and returned to his hotel room in the Seaview Hotel north of Miami Beach FL when he had a heart attack.